Looks like a variation of an arch mostly, they often have a bit like the centre, it's not quite a tented arch, and shows signs of almost a composite whorl! But I wouldn't say it is a loop. Would you hazard a guess at an interpretation of such a mixed form fingerprint? In 'The Science of Fingerprints' likewise examples are presented - see: examples 269, 270 + 271. Such combinations of fingerprint types are categorized as a 'accidental whorl' - and additionally one can always specify the combination involved, which concern here indeed: a loop + tented arch. "A combination of a loop and tented arch formation must have a loop formation appearing over the tented arch (see figures 269-270-271). Any loop and tented arch formation not in this position shall have the loop formation as the preferred patter." NOTICE: There reason why these patterns are grouped as a 'whorl'-variant is because it has two triradii. PS. 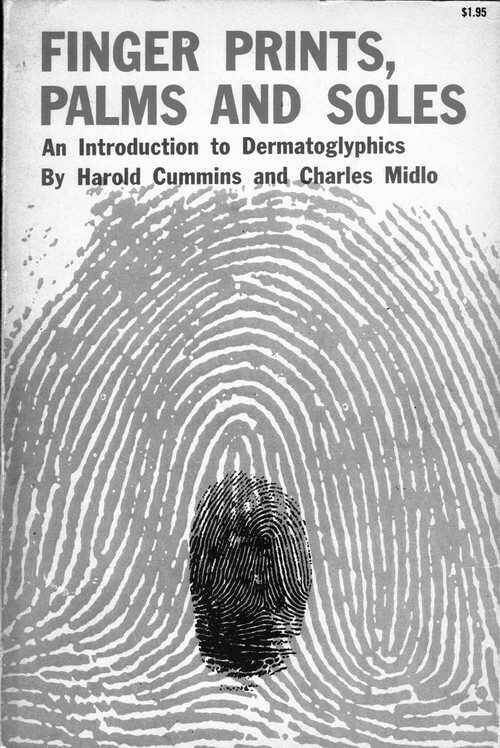 'Accidentals' are quite rare (seen in about 0.1% of all fingerprints), though most common on the index finger (0.5%) - according statistics provided by Cummins & Midlo (1943). hi kiwi, you are great at posting some interesting hands, prints & questions! In interpretation yes I would use both prints. Tho, to complicate matters, it is a radial "falling loop", like a sea wave crashing over the tented arch. People with falling loops can have lots of setbacks in life - just when they feel they are getting somewhere, the wave crashes over & thwarts them and they have to start again. But the tented arch would add dynamism & enthusiasm and so this person is likely not to be beaten by failure but rather have the motto "If at first you don't succeed, try try again." kiwihands wrote: Being a radial loop, would you say that these setbacks are usually caused by outside influences/ other people? Could be caused by, but really it is more about his reaction to outside influences/ other people. Radial loop can go two ways - either giving into others & not asserting themselves (because they don't know themselves) or over-reacting to others in an opposite way. for example if they have a strong thumb, often attack is the best form of defence, becoming apparently over-assertive (when inside they don't feel assertive at all). The tented arch could have same effect of wanting to over-assert, "my way or the highway". I find the 'falling loop' interpretation interesting. I've seen the loop a number of times and even a radial thumb loop forming this way. The interpretation, I've only seen on this board, I think. Since it's a dermatoglyphic pattern and a fingerprint, I wonder how the interpretation of failing or falling in life and picking oneself up and trying again relates. In one sense it sounds like a description of a constant loser - since it's a lifetime hand feature. At the same time there are other markings in the palms that relate to 'not giving up' or a lack of 'fear of success or failure' which I see as advantageous markings. One of these is the so called 'St. Andrew's Cross' that crosses between the life line and fate line in the bottom third of the palm. Although the descriptions I've read in other topics about this print leaned toward the negative or weakness, as I recall, I think anyone with the courage to 'try and try again' has a quality for success through hard work. Is this fingerprint from the same hand you uploaded with the inspiration loop? What 'inspired' me to ask, is it's interesting that each pattern, this fingerprint and the inspiration loop, each have two triradii, one that forms on each side of the recurve. If it's the same person that these two features are on, it would be significant to me. ...and what do you make of the fact that the 'falling part' is only made of ridges at the core area, and I'm not sure that any of these apparent 'falling' ridges are returning in a looping fashion at all. The larger outer loop is normal. The core area becomes odd with it's tented pattern and triradius. It's definitely two patterns combined into one. Martijn is correct that the two triradii cause it to be classified with the whorls in the FBI's system as an accidental. kiwihands wrote: Lynn, I'm 100% with you. It IS more about his reaction to outside influences/ other people. It's very interesting what you say about radial loops going two ways, I hadn't thought about it like this before. In this case "over-reacting to others in an opposite way" and over-asserting is definitely the case. Very good to know now where this all comes from ... oh and he does have a strong thumb, of course. In the sense of looking for other combinations. This description is one I would apply to a person with an inner life line (or Mars line) that is clearly parallel to the fate line. yes indeed, it's one and the same person. Do you mean 'significant' simply in the sense that he has two rare patterns, or would you see a connection in the way that you'd interpret them? I had never read anything about this kind of falling loop before, nor seen it in people, so I'm keeping an open mind as to what it may mean ... Lynn's interpretation does seem to fit with respect to this person's personal experience of setbacks in his life, but he's certainly not a "constant loser", quite the opposite. Lots of fighting spirit and drive to be the best at what he does. I think it would be significant in the sense that both looping patterns have two triradii at the area of the apparent recurve. 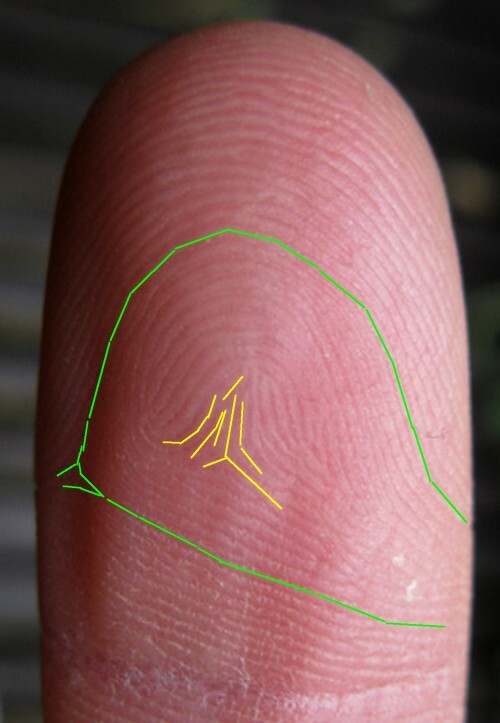 Although the fingerprint would be classified accidental, I think because of the similar pattern in the palm area the formation is related to some kind of genetic coding. Patti wrote: I find the 'falling loop' interpretation interesting. I've seen the loop a number of times and even a radial thumb loop forming this way. The interpretation, I've only seen on this board, I think. Sorry Patti I wrote it wrongly. Fingerprints are about our psychology and motivation rather than some fatliastic prediction! I should have written "a sense of" just as they are achieving something it all comes crashing down. Falling loop is too much water element, the wave crashes over, lose their motivation, can be hypersensitive & dependent on others, especially as in this case it is a radial loop. But as you say this guy's falling loop is minimal & has compensating features to "try, try again". Thanks Lynn for clarifying! Yes, I couldn't put my finger on what felt disturbing in the interpretation and 'prediction' is the right choice. Expecting things to go wrong, too, is like an anxiousness. An emotion. Is that what you mean by "sense of"? Loop people tend to be inspired by the world around them. Collecting ideas. The falling loop pattern can be formed both ways, with only one triradius, or like this one with two triradii. The two triradii, to me, would change the significance to whatever implications the fingerprint implies from a pattern with only one triradius. Lately, with more closely studying the formation of the ridges in development, I realized that the nervous system forms the pattern prior to the ridge formation. These patterns likely play a role in how data received from the environment is sent and processed by the brain. If I were to 'make up' a definition for this falling loop pattern, I would (after considering the number of triradii) compare it to both the implications of a long loop and a unwound whorl or an incomplete whorl. Whorl minds are researching and good at associating, and the loops are inquisitive and inspired (at least my way of interpreting them). I would blend these qualities - and lean one way or the other as to which is a greater influence. My whorly mind just can't associate this 'falling loop' pattern with emotional reactions to life, yet. Wouldn't a fear of something not working out be a 'learned' behavior from experiences? Cummin's & Midlo's book cover has a very similar print. It's also repeated again inside the book and marked as an accidental. HI Patti, I guess I'm not explaining it well. Being on top phalanges of fingers, fingerprints are more about our psychology & motivation. Not 'fear' or 'emotion', tho any water characteristic on a hand will bring a more subjective emotional motivation, perception, reaction. Nor 'expecting things to go wrong', but a sense of not having reached 'the crest of the wave'. Think of loops like waves on the sea - Imagine surfing on a high loop compared to surfing on a falling loop. Falling loop usually has another pattern underneath it, in this guys case the tented arch would give more dynamism & persistence than if the falling loop were half of a double loop. Thanks for explaining! I didn't realize we had such different views about the fingertips. I would apply motivational energy to the bottom phalange. For instance, the bottom phalange of the index finger is often related to appetite. Being hungry is a motivation to eat. etc. I apply the 'mind' to the fingertips and relate them to ideas and concepts. Actually, I thought that was the common application to the finger tips. Perception would fit, too. What I find difficult to accept is such a well described definition being applied to a feature that appears most likely on the index finger (which is the most frequent location to be found 0.52% out of 5,000 sample - and that number accounts for all accidentals - which means it's an even smaller number for a falling loop - page 67 Finger Prints Palms & Soles) On other fingers the appearance of accidentals is in the 0.0_ category! This is less than the radial loop on the thumb or little finger, or tented arches on the thumb, ring or little fingers. In past discussions (Handreading Cyber Cafe) it was argued that these prints were too infrequent and little research had been done to actually test implications of the prints. When I try to argue in my mind that the definition given fits the appearance of the print "rising and falling wave" and the appearance is being used as a description for experience in life - I'm stopped because we do the same thing with the whorl (spirling inward minds) and the loop (lassoing ideas) and it seems to work. Do you know who developed this definition? Falling loops are more common than the % you quoted Patti as they're not confined to accidentals. eg some double loops, lateral pocket loops, nutant loops.